The three-way control valve uses only one control pressure line to the actuator with the normal pressure supply line and a drain or return line. 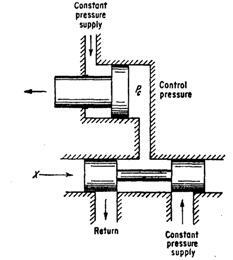 This type of valve is illustrated by Fig. 1.20. 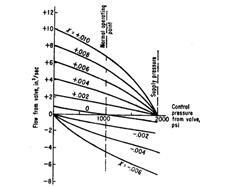 As can be noticed, the valve provides a force in only one direction on the piston, thereby requiring some means for returning the piston, such as a spring or a reduced-area piston supplied with the Constant-pressure fluid. The three-way Valve is equivalent to only about one-half of the four-way valve with reference to power output and control characteristics. within a limited range of operation.